A couple weeks ago, I joined the Illinois Field Moms for a day out. Part of our day included a visit to the Northern Illinois Food Bank. The food bank is located in Geneva, IL, and is a large distribution building in the middle of an industrial area. The Field Moms were able to take a tour of the new building, which includes a clean room to repackage bulk food donations, and also a freezer docking area, which keeps frozen donations from thawing during the unloading process. 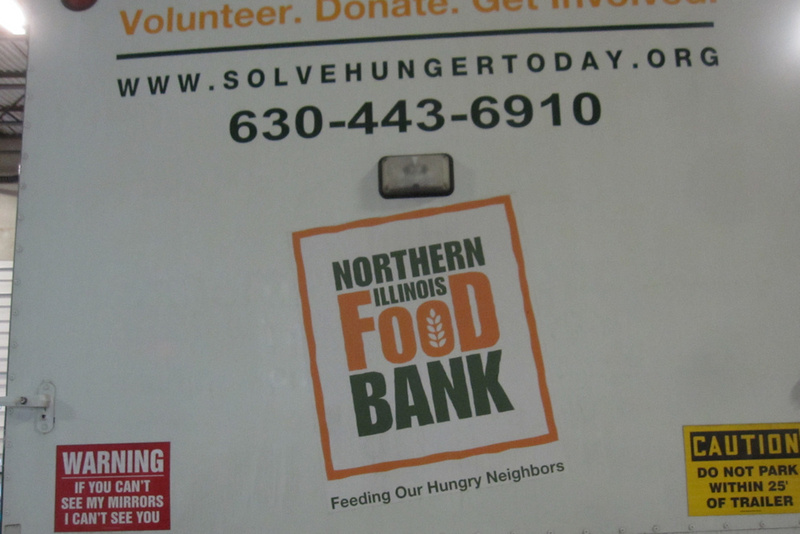 Northern Illinois Food Bank distributes food, which is mostly donated, to network partners including soup kitchens and food pantries in thirteen Illinois counties. They also have a mobile pantry program, which brings food to areas that need it. 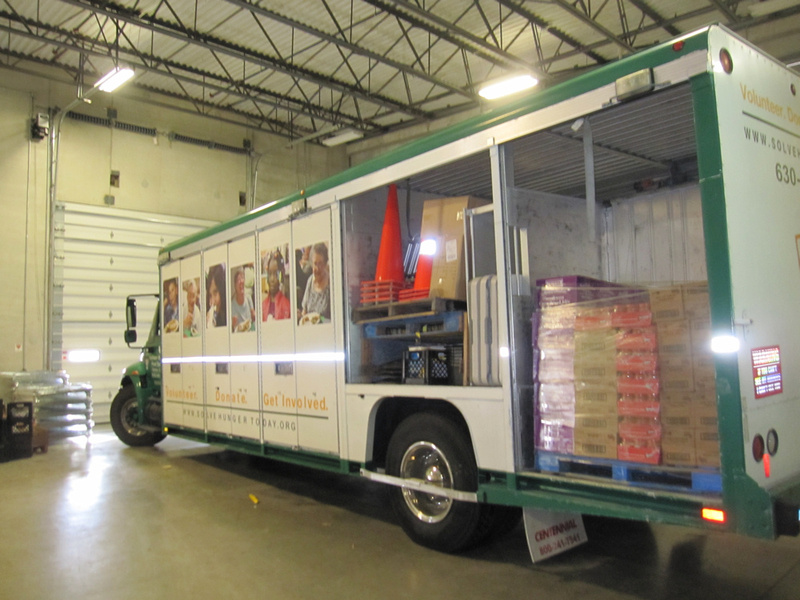 This truck is part of the Mobile Pantry Program and brings the food pantry to hungry neighbors. After our tour, it was time for the Field Moms to get to work. 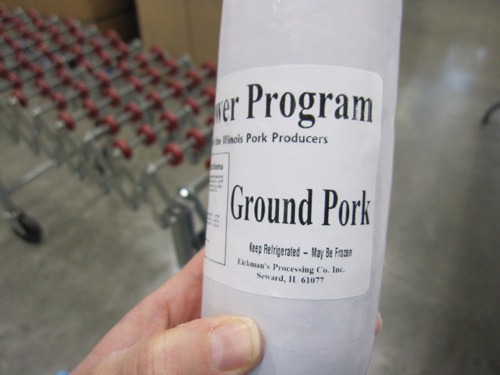 The profits from our Field Moms’ Acre and Pen provided 780 pounds of ground pork for the food bank! Presenting the pork to the Food Bank was the easy part. Then we were put to work sorting various frozen meats into 20 pound boxes. Natasha from Houseful of Nicholes and I assembled boxes like maniacs while other field moms sorted, relabeled and weighed the meat. We donated 780 pounds of pork! One of the things I learned while at the food bank is that protein can be difficult to get at a food pantry. Our local high school had a food drive last week, and so I kept this in mind and included some cans of chicken in my donation. I’m so grateful that the IL Field Moms program ended on such a high note! If you are in the Chicago area and have children under the age of 18, now is the time to apply to be a 2014 Field Mom! Find out more on the website, Watch Us Grow. Link up your Thankful posts to The Spin Cycle this week! I’m also linking up with The Thanksgiving Feast and Festivities linky party with Julie! Julie Moore recently posted…The Thanksgiving Feast and Festivities Link-Up ~ Happy Thanksgiving! I’ll have to remember that protein thing when my church group does another food drive. Thanks for sharing about your experience! What a terrific organization, and a wonderful experience! That’ so interesting about the protein thing. I’ll have to remember to stick in tuna and chicken in the next food drive. What a great project. And thank you for the tip about protein. I know that it makes a huge difference to me to have it in my diet, so if I’m donating food to our local survival center/soup kitchen/pantry, I do think about donating the kinds of foods I stress to my family to eat.